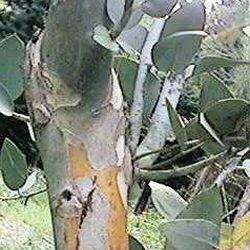 Not disimilar in many respects to Cider Gum, the Snow Gum Eucalyptus tree (Eucalyptus paucifolia subsp. niphophila) is one of the hardiest of all gums. Originating in the mountainous areas of south east Australia, this is an elegant tree that has a quite rounded form. Its stem is quite white in appearance and it has lanceolate shaped leaves. A good choice for a medium sized garden as this tree can reach a height of 15m (50ft). Our snow gum is supplied at a height of 1.25 metres in a 7 litre container, which means that the tree can be planted any time of the year and with better results than either bare-root or rootballed trees.